So it’s salmon season in the Pacific Northwest, and we are starting to see whole wild salmons appearing in the supermarket. Last week when we were at the grocery store, I talked Jeremy out of getting one, just for sheer size. But a few days later, he made a trip to Costco, and somehow a 3.5lb wild sockeye (sans head) jumped into the car and followed him home. 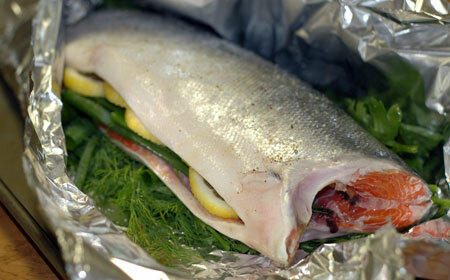 I roasted it pretty simply seasoned in a foil pouch, on a bed of parsley and dill and stuffed with dill, lemon, and spring onions. I also poured in some clam juice and fresh lemon juice, then sealed it all up and cooked it at 375F for about 40 minutes. 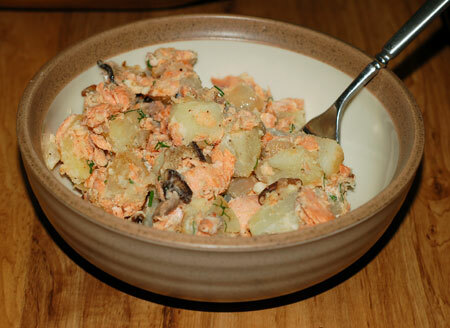 It came out flaky and very flavorful, with that firm meaty flesh you just don’t get from farmed Atlantic salmon. Jeremy performed filleting duties while I made my favorite quick sauce for fish, based on this recipe: green onion sliced thin and sauteed until tender in a tablespoon of butter, then simmered in white wine until it has nearly boiled off. To go with the fish, I made lemon-scallion rice in the rice cooker, according to Simply Ming : Just add a few sliced scallions and some fresh lemon juice and zest to your rice and water before starting the cooker, and hit Start. I think the lemon juice gave the rice an extra-sticky texture, but it had good flavor, and married nicely with the lemony fish. Needless to say, we had leftover salmon coming out our ears. I’ve already done salmon croquettes, and it is definitely too warm right now for chowder. So I found a few new recipes to add to my arsenal, a simple salmon frittata with corn, peppers and Gruyere, and a dilly salmon-potato hash with shiitake mushrooms. For the frittata, I used the general recipe here, using frozen corn and diced frozen peppers, and subbing scallions for onions and of course leftover salmon for canned. 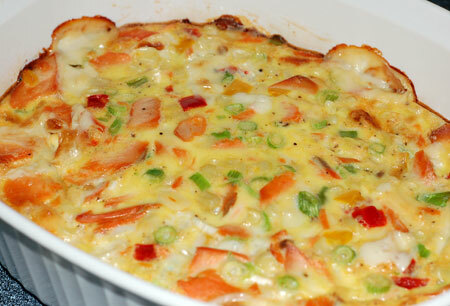 It was very tasty, but I think if I make it again with salmon, I’ll use lots of red peppers and forget the corn. The hash worked out nicely because I just happened to have a small bag of shiitakes that needed to be eaten before they dried out. I didn’t have any sour cream, though, so I took the chance and used some Greek yogurt instead. We couldn’t tell the difference. Nolan woke up just as I was finishing it, so the pic was taken one-handed, and I forgot I had meant to top the hash with some fried or poached eggs, but it stood alone just fine. Place 1/2 of the oil in a heavy skillet over high heat, and when hot, add the onion and saute until slightly crunchy, 3 to 5 minutes. Add the mushroom, and cook until just wilted, about 2 minutes. Add the garlic and saute for 1 minute. Remove to a mixing bowl and set aside. In the same skillet, add the remaining oil, bring to medium heat, and add the potatoes. Cook until the edges are just crisp, about 5 minutes. 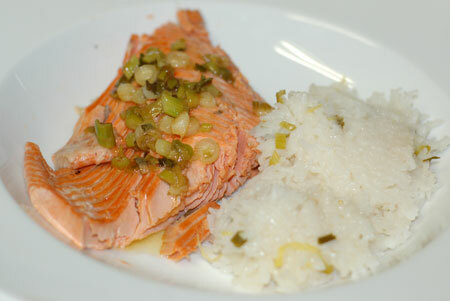 Remove from the heat and mix with the reserved onions, and add salmon, yogurt, lemon juice, and dill. Season to taste with the salt and pepper, and mix well, but do not pack the mixture. Return the mixture to a skillet, and cook over medium heat, tossing to prevent the hash from sticking. Remove to a warm plate, and serve. Garnish the hash with anything you like best, from sour cream to poached eggs.